Some years ago, Mike and I took a tour of a large church shortly after it opened. I don’t want to say where it was or which faith it was because neither is important to this story, but I want to mention that it was huge and ornate and gaudy. At the end of the tour, we filled out a review card which threw me for a loop because we were touring a church, for heaven’s sake, not a museum or restaurant or other tourist attraction. “Wouldn’t the amount of money you put into restoring this church go a lot further if you dedicated said funds to the homeless and hungry outside of your doors?” I snarked. In all honesty, the financial holdings of many churches is staggering. According to a number of sites, the top five richest churches in the world are Catholic, Islam, Judaism, Church of Jesus Christ of Latter Day Saints, and Church of England. The Episcopalians, Protestants (most lumped together for some reason), Televangelists (again, lumped together), and Scientologists are in the mix, too. The portfolios of most include art, real estate, investments, and other holdings and can run into the billions and trillions of dollars. I bring up this information because it bothers me to no end to see such ostentatious displays of wealth in places where God and caring for his flock should be numero uno. The Russian Orthodox Church is no financial lightweight, either. Last year marked the centenary anniversary of the Bolshevik Revolution which attempted to destroy all symbols of the Russian aristocracy and imperial dynasty. They executed the Romanovs, as we know, as well as several leaders of the Orthodox Church because it had, for centuries, supported the czars. The Communist regime destroyed several churches (One they replaced with a swimming pool. ), looted others, and turned many into museums (oft against religion). The atheists forbid practicing religion and persecuted those who did. That brings me to Russia, St. Petersburg, and the cathedrals we saw there. While both St. Isaac’s Cathedral and The Church on the Spilt Blood survived complete destruction after the revolution and world wars, they did suffer from damage and severe plundering by different forces. I’ll avoid discussing the differences in theological beliefs between Catholicism and Orthodoxy as they are significant and complicated. The largest Orthodox cathedral in the world, St. Isaac’s Cathedral is dedicated to the saint on whose feast day Peter the Great was born. It is the fourth church to stand on that particular square, and it took 40 years to complete (1818-1858). Because the ground under it was unstable, workers sank wooden piles into the soil (estimates range to 25,000) for stability. If you look at the photo above, note the red granite columns on three different levels. In all, there are 112 columns—48 on the ground, 24 on the cupola, eight on each of the smaller four domes, and two on each of the four large windows (not visible). The columns are so massive that workers had to place them before work on the main cathedral body could begin. 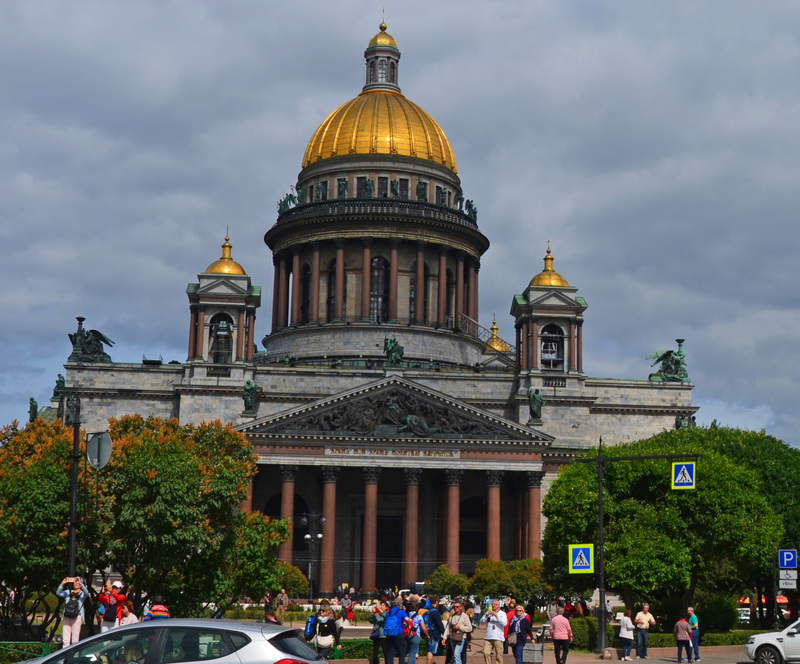 The dome, visible from much of St. Petersburg, rises 333 feet from the ground. More than 220 pounds of pure gold cover the main dome, and 12 electroplated angel statues decorate it. During World War II, the cathedral was a Nazi reference point, so the Russians covered it in brown paint to disguise it. Flanking the altars are iconostases—walls of icons. (I don’t want to get into too much detail, but most Orthodox churches have an iconstasis. 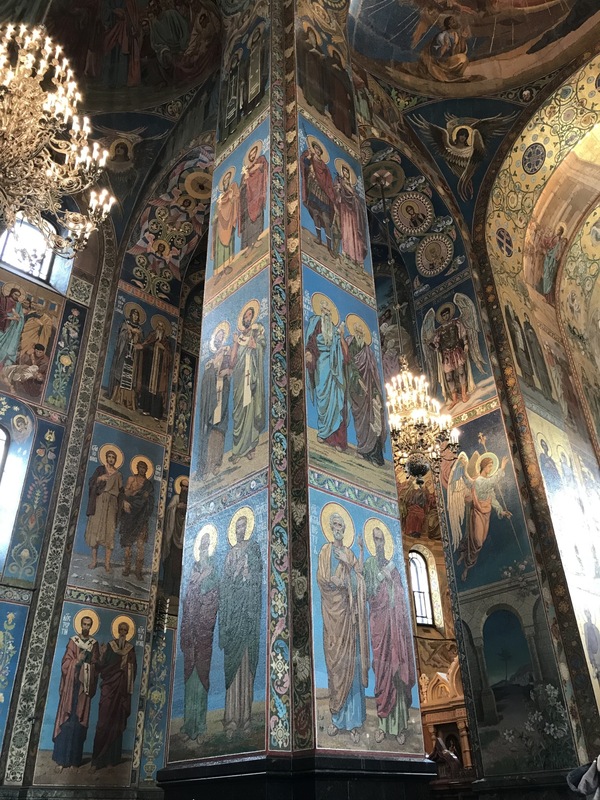 There are five tiers to an iconostasis, and the placement of icons depends on a number of guidelines.) . Behind the main altar is a large stained-glass window of Christ Resurrected. The icons on in iconostasis are all mosaics. If you look at the photo below, you can see the upper tiers of the iconostasis. After the Russian Revolution, the church closed until 1928 when it reopened as the Museum of the History of Religion and Atheism. After the fall of communism, regular religious services started again in the side altars. The main altar is used only for high services on feast days. The Ministry of Culture still controls the cathedral, but in 2019, it will return to the Russian Orthodox Church for a period of 49 years. There is a huge controversy over this as many are afraid the church will not take care of it as well as the government has. Weird name for a church, right? I thought so until our guide explained that the church stands on the spot where Czar Alexander II was fatally wounded when revolutionaries threw bombs at his carriage as it passed the spot in March 1881. The czar bled profusely and returned to the palace where he passed a few hours later. His son, Alexander III, declared he would build the church on the spot as a memorial to his father, and the family and aristocracy funded its building. The church stands over the section of the road where the czar’s carriage was when the bombing occurred, and a shrine marking the spot is opposite the main altar. You can see the road’s cobblestone on the floor of the shrine. 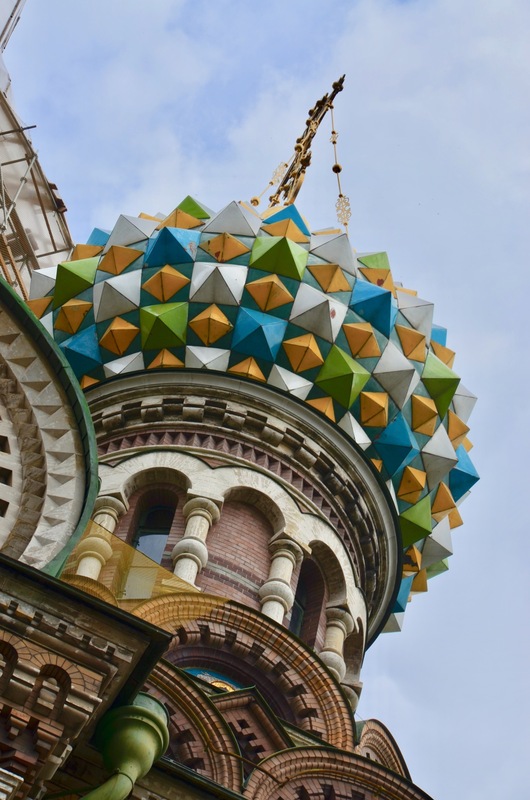 Architecturally, the church is quite different from most of the other churches and buildings in St. Petersburg. If you remember, I mentioned that Peter the Great wanted St. Petersburg to be more western, so Baroque and Neoclassic architecture are the norms. Church of the Spilt Blood, however, reflects the medieval Russian architecture found in other cities, particularly Moscow. Note the onion domes which crown the church. Mosaics cover the interior of the church. Literally. More than 7500 square meters—80729+ square feet—of jasper, malachite, lapis lazuli, marbles, gold, and more cover the walls, floors, and ceiling. Most are biblical scenes and saints recreated in intricate mosaic art. The church was never traditional in the sense that it was not a place for regular masses, weddings, baptisms, funerals or services of any kind. Instead, the church held weekly “requiems” for Alexander II which included biblical readings and sermons. Looters practically destroyed the church after the revolution, and the Soviet government closed it. During World War II, the Nazis used it as a temporary morgue, and afterward, it was a warehouse that stored vegetables. Rumors were that the government wanted it torn down. In 1970, the government turned control of the church to St. Isaac’s Cathedral (which was under the Ministry of Culture, remember), and officials turned it into a museum. 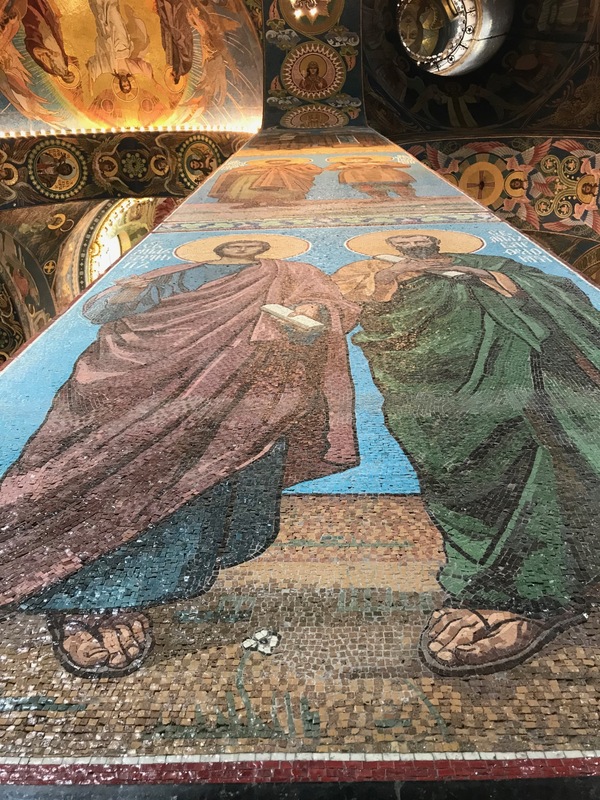 For 27 years, restorers worked from old photos and lithographs to recreate the original mosaics and such. The church never reconsecrated it, so the church cannot hold any religious service. It reopened to the public as a museum in 1997 and is still a main tourist attraction today. “Were the mosaics made in Venice? Murano?” I asked our guide as we walked through the massive structure. Wrong question.